Double-headers don't come around every weekend. And if you've going to see one, you pretty much know what you're in store for. But Saturday, about 2 miles north of trackside Safeco Field, and several hours before the Mariners hit the field, visitors to Belltown's Seattle's Olympic Sculpture Park were treated to a double-header of another sort. Most of us were caught by surprise. Sporting bigger numerals than you'll ever fine on a baseball jersey, numbers 844 and 4449 double-headed right past Calder's Eagle and through the park, whistling away in a cloud of steam. 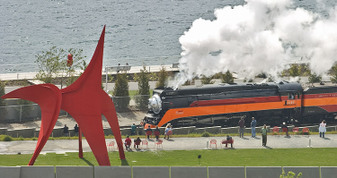 Union Pacific 844, the last steam engine delivered to Union Pacific, in 1944, pulled lead on the northbound leg of the Puget Sound Steam Special from Tacoma to Everett, a benefit for the Barriger Library of the University of Missouri at St. Louis, and the Oregon Rail Heritage Foundation. After decades of pulling passengers and freight, the 844 now serves as Union Pacific's goodwill ambassador, and remains the only Class 1 railroad steam locomotive never to be retired. A few hours later, on the southbound leg of the excursion, the 4-8-4 configured locomotive Southern Pacific 4449 had the honors of pulling lead back to Tacoma. Built by Lima Locomotive Works in Lima, Ohio, 4449 began its interesting history pulling SP's premier passenger runs in California, including the Coast Daylight, and was one of two locomotives to pull the American Freedom Train during the United States Bicentennial. What did this SOUND like? I bet the whole panoramic view from your place was unforgettable. The trains don't seem to belong, but they seem terribly foreign either. Hey Hank - everything that rolls through, or floats by, the OSP seems to fit. Sixty year old steam locomotives, tugboat races (coming soon) or a jet fuselage in search of its wings. Check out a few minutes of the video and you'll get the "sound" experience. Thanks for all the updates on what's going on around your town. Love those Seattle photos. Thanks!